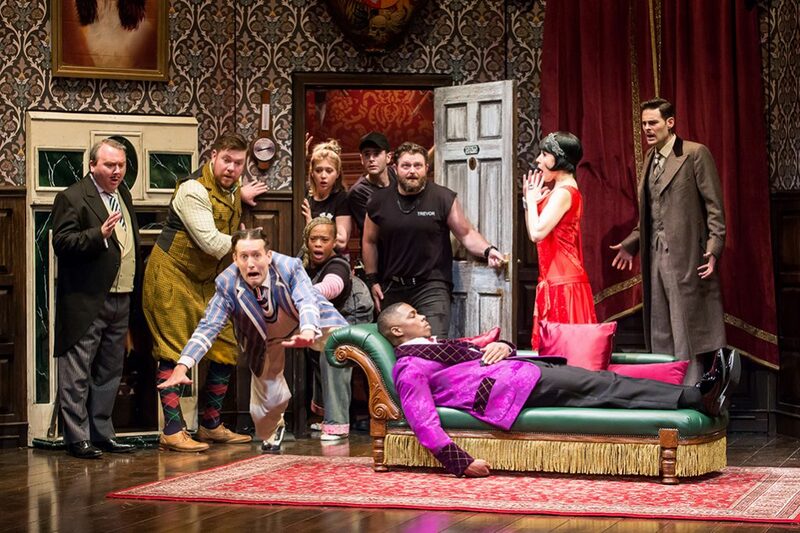 Even before the houselights dim, The Play That Goes Wrong is going wrong. On the uncurtained stage, a techie is still working on the floorboards and the stage manager is frantically trying to secure a part of the set. She recruits an audience member to help out while she goes in search of the dog who’s supposed to appear in Act Two. This is a preview of things to come in this English import and current Broadway hit, whose national tour is stopping at Hartford’s Bushnell Center for the Performing Arts through Sept. 30. 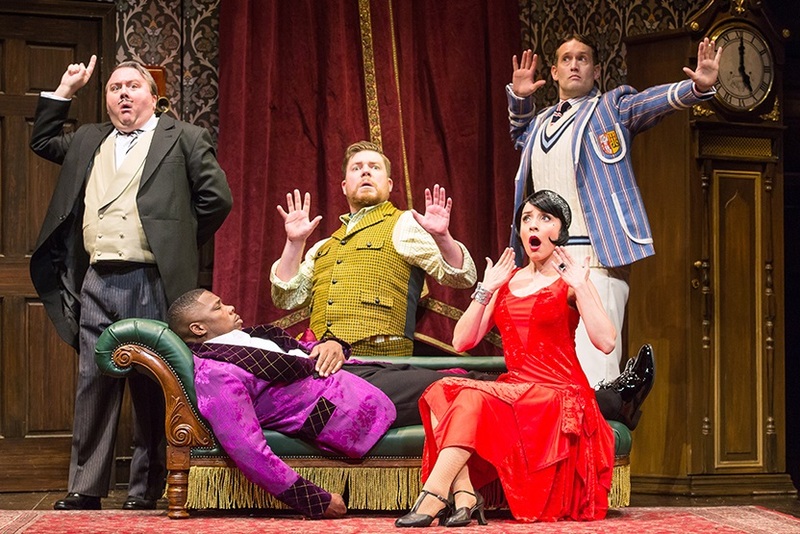 The invention of Britain’s Mischief Theatre Company, it’s a send-up of inept community theater built around a send-up of period Agatha Christie-style whodunnits. Not that the perfunctory plot of The Murder at Haversham Manor, clumsily acted by an amateur theater group, is anything more than a scaffold on which to hang all the things that go wrong. It’s a clever if not original conceit, worked out in a stream of pratfalls, spit takes, muffed lines, missed cues, props that don’t behave or aren’t there, and self-conscious ham acting. The corpse, lying center-stage, gives himself away with twitches before having to sneak offstage when the stretcher meant to carry him collapses. One of the actors has key words written on his hand, and mispronounces them: “om-un-ous,” “fack-ade.” The ingenue is cold-cocked by an opening door and replaced by the stage manager, then by the techie, who otherwise slouches in a booth at the side of the stage and messes up the sound cues. 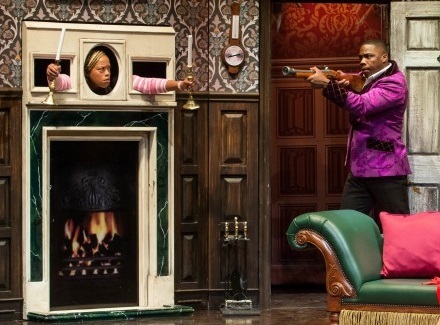 Nigel Hook’s Tony-winning set is the theater group’s tacky approximation of wood-paneled luxury, with an additional upstairs room perched precariously in one corner. It includes an old-fashioned telephone on a long cord, a large coat of arms above the doorway, a brace of dueling sabers slung by the fireplace, a grandfather clock, and a can of paint thinner left on the set by the techie. If you expect that all of these will come into play in the course of the evening, you won’t be disappointed. Inserted into this run are a couple of gags for the local audience. In a curtain speech, the amateur troupe’s director apologizes for “that unfortunate mix-up at the box office,” and hopes “you will enjoy tonight’s show as much as you would have enjoyed Hamilton” (which comes to the Bushnell in December). And at one point during the performance, now playing the lead role, he turns on the audience, scolding us for laughing at the bungling players. “You wouldn’t act this way at Hartford Stage,” he snarls. These days, touring productions are often every bit as good as the Broadway versions they’re replicating. But this road company, directed by Matt DiCarlo from Mark Bell’s original staging, is not as sharp as it could be. Some of the timing should be tighter, the comic takes snappier, and the performances more varied. Most of the actors (a refreshingly “color-blind” cast) have adopted a one-note posture of overwrought bad acting and stuck with it. Exceptions include Angela Grovey, whose stage manager is at first panicked at having to step into the spotlight, then starts enjoying the role so much that she’s prepared to fight for it; and Sid Solomon – an understudy – as the callow (and gay) actor playing the romantic juvenile, acting out his lines like Charades and smirking at the audience. Of course, the whole thing is about the mechanics of disaster, in which the actors are primarily animate props. That said, The Play That Goes Wrong is very funny, some of the set pieces are priceless, and the cascading calamities don’t let up until the very end. If you expect that the only thing that could top all the mayhem of the previous two hours is the entire set collapsing, you won’t be disappointed.